There’s nothing quite like the experience of having your first novel appear on bookshop shelves. And nothing quite like the learning curve involved in getting the book there in the first place. 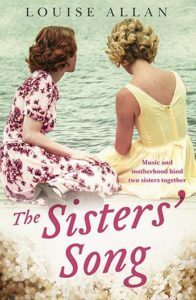 Today, I’m pleased to welcome debut author Louise Allan to my blog, to share the process behind getting her first book The Sisters’ Song (Allen & Unwin) from idea to published novel – and all the things she learnt along the way. Sometimes I look at my book and can’t believe I’ve written one! I didn’t start my working life as a writer but came to it much later than most. But being older didn’t excuse me from doing my writing apprenticeship—I still had to learn the craft and it wasn’t at all easy. There were hair-tearing moments, disappointments, times I needed to take a break, and times I needed to talk myself into returning to my keyboard. Here are some of the things I’ve learnt along the way. This list is by no means exhaustive, but includes tips about the craft of writing as well as organising your time. Don’t make excuses, just do it! Yes, it might be easier once the kids are all in high school, or once Christmas is over, or once you have a dedicated writing space, but if you keep putting it off, you’ll find you’ll be forever waiting because the perfect time will never come. You’ll never get a clear diary. Your kids will always have something on. Your writing space will never be perfectly set up. But it doesn’t matter—start anyway. Even 30 minutes a day. Don’t put it off. Just start. Get those fingers on the keyboard and start typing. It’s the only way to write a book. I found saying No the hardest thing of all. I felt guilty, as if I was letting people down. I kept telling myself that this was my time and I was entitled to it, and eventually, people stopped asking me to meet them or volunteer, which caused more guilt. I reminded myself that mums who work outside of the home can’t do these things either, and that my writing was now my job. They’re your tribe. They’ll understand you more than anyone. They’ll be genuinely interested in the book your writing and they get your need to write it. Being around them will keep you motivated, just by reminding you why you started it in the first place. After you’ve been rejected, they’ll tell you about theirs. They’re very helpful people, great sources of advice, support and comfort. And when your book comes out, they’ll be your biggest supporters. Everyone tells you this and you might think it will take away from your actual novel-writing time. It’s also rather daunting, especially at first, and you’ll feel a bit vulnerable. You also feel as if you’re putting your work out there and no one’s listening. I started a blog and Facebook page in early 2013 when I’d was about to finish the first draft of my novel. I had 39 Facebook followers for quite a few months, but I kept going, posting consistently and trying to be myself. I made a lot of mistakes, but only those 39 Facebook followers know about those! Over time, I’ve relaxed and got better at it, and slowly built up a loyal following. Because we’ve been together for nearly five years, my followers and I know each other well, and since the release of my book, they’ve been amazing, jumping on board and championing it. So, start a blog and Facebook page early even if you feel as if no one is listening. Be yourself and post consistently. Don’t worry if you make a mistake—just hit the Delete button! Give people time to come, and when your book’s published, you’ll have a group of followers who are more than willing to support you because they’ve been with you all the way. Writing’s meant to be fun, too, so explore. Go off on tangents. Be adventurous. Be free. There are no restrictions, not when you’re drafting. Write your deepest fears, your most embarrassing moments, even things that might seem really wacky and over the top. Overwrite a scene, you can always pare it back later. Or delete it. I don’t believe any writing is ever wasted, even if it doesn’t make it into the final version. I have 190,000 words sitting in my ‘Outtakes’ folder, and every single one of them was necessary to making the final version of my novel what it is. I can’t stress this one strongly enough, especially when you’re starting out. Actively seek feedback whenever you can. Join a writing group and share writing with each other. If there’s a writer-in-residence at your local writers’ centre, they’ll often look over a couple of chapters, and give you pointers which you can then use to go through the rest of your manuscript. Before sending your work out to agents and publishers, consider getting a formal manuscript appraisal. Work with a mentor even. Separate yourself from your writing while you’re getting the feedback. Talk about it as if it’s an object and not part of you. Look at it as critically as you can. Tell yourself that it will make it better, because that’s the aim, after all. Don’t defend it and don’t get upset. If you’re not sure of what the critique means, just ask the reader to elaborate. Even if you disagree, listen anyway and think about it. In my personal experience, I’ve never encountered anyone with an ulterior motive. Every single person has been trying to help when giving me feedback. Besides, if your book is ever picked up by a publisher, believe me, they won’t go easy on you during the editing. If you want to be a published author, at some stage you’ll have to get used to hearing feedback. Following on from the previous point, no first draft is ever ready for publishing. Nor a second or third. It’s tedious and hard, but you just have to sit at the computer and go over your words time and again. I’ve lost count of my redrafts and rewrites, but each time, it’s improved it. Believe me. It takes a long time to write 90,000 good words from your imagination onto the page, structured in such a way as to take the reader on a enjoyable ride. There are no corners you can cut, and if it’s your first novel, there are no ways you can avoid making at least some rookie mistakes. Then there are family, paid work and general living that also get in the way. Sometimes, the words just won’t come, and you’ll need to take a break. It took me six years to write my novel, which sounds like a long time but doesn’t actually feel that long because I was busy all those years. Now that it’s published, I’m glad it took as long as it did—the story has benefitted from the extra incubation time. Never, ever give up. Remember the Ira Glass quote. Aim for that ideal vision of your book that you have in your head, but go easy on yourself as you head towards it. Allow yourself to be a learner and make mistakes. Write the novel you want to read. Chances are, others will want to read it, too. Louise Allan’s first novel, The Sisters’ Song, is out now with Allen & Unwin. The manuscript has previously been shortlisted for the 2014 City of Fremantle—TAG Hungerford Award and awarded a Varuna Residential Fellowship. Find out more about Louise and her wonderful book here. 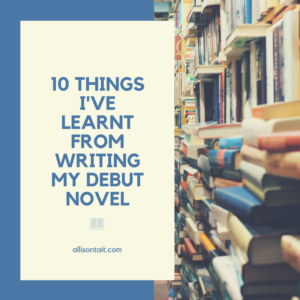 Interested in writing your own debut novel? You might find these links helpful.